From one English Major nerd to another, I cannot tell you how this delighted me. 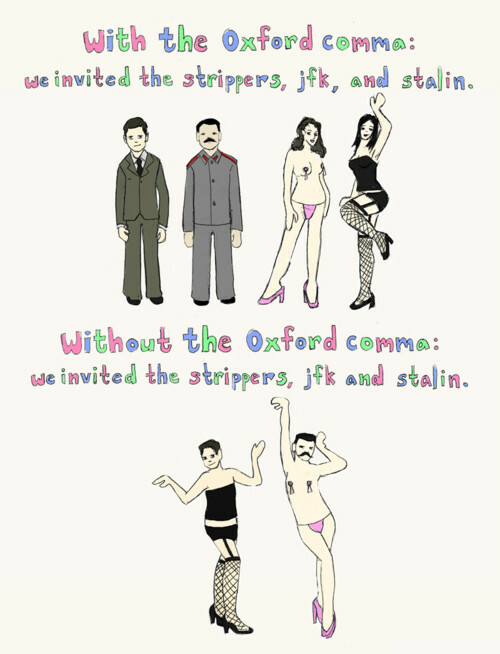 Honestly, I went back to school after many years, so I was out of touch with the use of the Oxford Comma, but you have given me the best illustration ever of why it is important. Thank you. Also, I laughed out loud at 2:20 AM. I am sure the neighbors wonder about me. Thank you! I’m glad you liked my post. I’m also glad I could make you laugh out loud at 2:20 a.m.
Oh yeah, I’ve definitely heard of the song. I remember a meme went around after the AP decided to omit the Oxford comma from their stylebook. I’m pretty sure that song was the basis of it.